Uniquely located on the fifth floor over looking the river from the tree tops, this corner unit facing west is very rarely offered. With 1245 Sq Ft. this condo comes with an open floor plan having a large living room and dining area, bright and airy eat in kitchen with tasteful granite, plenty of counter space and classy glass upper cabinets. The master bedroom is quite a master suite being 16 x 12 feet plus a 4 piece ensuite bath with jetted tub, linen closet and a walk-in closet. They just don’t make master bedrooms like this anymore. The second bedroom is a flex room, use it for a bedroom, den or office. Simply opening or closing the doors gives you many options. The unit has a very spacious entry with double front closets and a nice in-suite laundry room. Each and every room gives you a beautiful panoramic view of the river. Lately bald eagles have been spotted from the balconies. 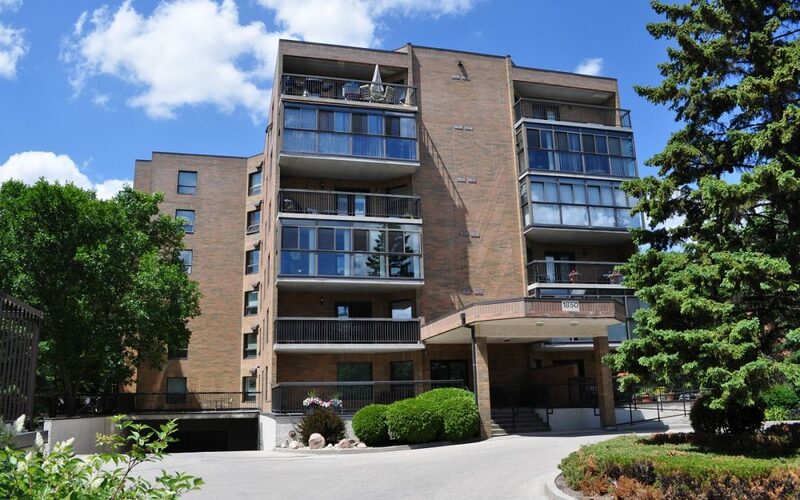 Did we mention that this condo has concrete floors and comes with two parking stalls? The complete package.